Into a pot of boiling water, place wholegrain rice and cook until light and fluffy. Remove the fat from the pork chops and cut into strips. 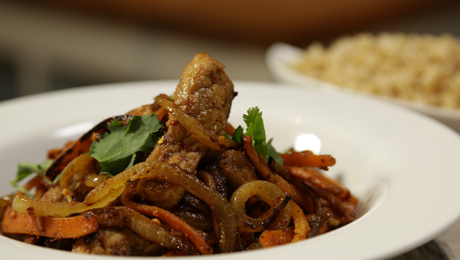 Combine the pork, garlic, soy sauce, cumin and chopped red chilli in a bowl. In a wok heat 1 tbspn of oil. Add the onion and carrots, and cook. Add the pork mixture and cook until browned on the bottom (about 2 minutes). Add coriander as a garnish.